My Turkey Black Bean Chili is a favorite cold weather recipe in our house. It is so easy to throw together and let cook all day in your favorite slow cooker that you will wonder why you haven’t made it more often. We love the addition of sweet potato for texture and flavor. Our lives are busy. We barely have time for each other and all of the tasks that annoyingly cloud our to-do lists. Some of us even make a list to make lists! 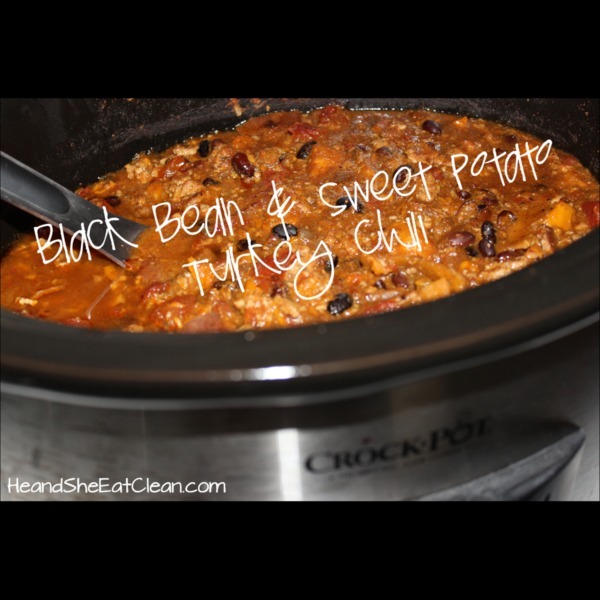 Why not take a little bit of time to slow cook a pot of slow cooker Turkey Black Bean Chili? Chances are, it will be ready when you are! I prefer cooking this in a 6-quart slow cooker. You can make smaller batches in a smaller slow cooker if needed. It is also excellent for making in large batches to portion and freezer for future meals. I love making a simple slow cooker meal, and this chili recipe is, of course, one I keep in rotation during the cool weather months. While this is one of those recipes that is easy to make already, I always appreciate any tips that make it take less time. Below are two of my favorite tricks to making this easy. Everyone loves a big bowl of chili for dinner. I love adding a little zip to mine by mixing things up. Below are some of the ways we mix it up to make dinner time delicious and easy. This also helps a large batch of chili disappear faster without wasting any food when we get tired of eating the same thing at every meal. If you want a different spin on dinner other than our turkey black bean chili, then make sure to check out the links below. We have tons of delicious flavorful chili recipes to get you through the cold winter months of soup season. Crockpot Turkey Black Bean Chili is the ideal recipe for keeping you satisfied while staying healthy. A delicious combination of flavors makes this one to keep on rotation on a regular basis. 1. Put vegetables and beans in the bottom of the crockpot. 2. Layer ground turkey breast, spices, seasoning and water. 3. Place lid on crockpot and cook on low for eight hours. 4. Carefully remove lid and stir chili. Adjust seasonings to taste. 5. Replace lid, cook for an additional 20-30 minutes on low. Serve. If you are pressed for time, 1 hr on high equals 2 hours on low. I’m workin on this recipe for the 3rd time. I love it! I love the spice of it. And everyone I share it with loves it too! Delicious. Hi Angie, Thank you for taking the time to comment! I’m so glad that you love the recipe. A favorite in our household for the past 4 years. I usually serve it with homemade pumpkin cornbread and the flavors really compliment each other! I LOVE this recipe! I hardly ever make regular chili anymore because I love this one so much. This has been on my regular rotation for a few years now. I share it often, too! Thanks for sharing such a tasty and easy recipe! Amazingly great meal. Little to no effort and the family loved it. Thank you. Had this for dinner tonight and it was delicious. This will be in the rotation for sure. Thank you for sharing! I love this recipe! I make it at least once a month. It’s the perfect dish for anyone that’s on the go but still wants to eat healthy. Thank you for sharing. I made this last week and absolutely amazing. Had it ready when we got home from my daughters dance class. She is 5 years old and loved it!! I love showing and teaching her a healthy lifestyle. Thank you for your amazing recipes, can’t wait to try more. I am eating this now and it’s AMAZING!!! Perfect on a chilly, rainy fall day! Thank you for sharing. Hi there! Just wanted to let you know I tried this recipe for my blog and it was AMAZING!!!! I absolutely loooooved it! It is probably the most flavourful chilli I’ve ever had. Thanks so much! Feel free to check out my site! I try recipes I’ve pinned on Pinterest and see what works and what doesn’t. This was the perfect dinner for a cold winter night. I’ve had some nasty congestion as well and the spiciness of this chili helped clear my sinuses. I’ll be enjoying this for a few days, so delicious. This was amazing!! My hubby is so picky and hates sweet potatoes – he had seconds!! Thanks for the great recipe – it’s a keeper!! I loved this recipe. My ground meat was cooked and not raw, but it still turned out fabulously. I am a huge fan of your site. Thank you for all the great ideas. I made this recently and I have to admit that I was pretty skeptical. I didn’t think my hubby would go for it, especially with the sweet potatoes in it. But we both really liked it. My husband took leftovers to work for lunch the next day (that’s the true test to see if he really likes something) and was disappointed the next day when it was gone and he couldn’t take it to work again. Thanks for the great recipe! Hi! I just stumbled upon your blog yesterday and am so thankful I did! I have been eating clean for a few years now and love it! I got married this past summer and since then my diet has changed drastically with a hubby who loves anything deep fried and chocolate! 🙂 I have gotten him on board to move back towards a “clean” diet I just didn’t know how to cook meals like I used to because they just wouldn’t satisfy a 6’3 210lb man! haha I was pretty clueless until I found your blog! I have already made the quiche recipe for lunch and my husband loved it! I am planning on trying out your recipes all week! Tomorrow I am making this chili! I can’t wait! Thanks for all of your recipes and tips for eating clean married! 🙂 Also- if I make this in the morning and don’t come home until 9ish hours or so later will that be okay or will it over heat? 100% Delicious and satisfying! You’ve made me a believer in ground turkey! Lots of yummy flavor and still clean and healthy… thanks for sharing!!! I made this last night – it was soooooo good!!! I am so excited to have discovered your website, and I can’t wait to start eating clean! I had already started cutting back on my processed foods and have felt much better, but I am ready to make the full-time commitment! Thank you for the wonderful recipe ideas – I am not adept in the kitchen at all so without these there is no way I would even know where to begin! This Chili was amazing! I omitted the onion because I am not a fan. I also cooked it on the stove (3 1/2 hours on low) because unfortunately I do not have a crock pot, but I think santa is bringing me one this year. YUMMY!!!!! YUM! I made this tonight, and it was family approved! Incredible recipe. Just the right amount of spice. I don’t like the texture of cooked sweet potatoes, so I shredded them instead of the cubing them. They cook down right into the stock and add a great texture. Delicious!!! I’ve been food prepping and Eating clean for about 5 weeks now. I’ve been going thru each of ur recipes and trying a new one each week. Today was the chili and it was fabulous!!! I’ve dropped 4 pound and feel healthy just from doing the prep. Please keep adding recipes!!! You r helping so much!!! This is amazing! My husband is not home yet so he hasnt tasted it. I am a little worried about he reaction because he is not a big fan of sweet potatoes in chunks. He LOVES pumpkin though – do you think I could use a can of raw pumpkin in it next time and still have good results? I am sure that sweet potatoes are more nutritious…but that might be a variation worth trying! I made this with the chicken stock and had it today. It was AMAZING! Thank you for the great recipe! Just found your site from my cousin who posted it on Facebook! I started eating clean TODAY! (YAY) and I have 3 pounds of ground turkey in my freezer that I had no idea what to do with! I’m going to try this recipe soon! Would it be okay to use 1.5 cups of homemade chicken stock for the water. There is no added salt or fat in my stock. I boiled a chicken with black peppercorns, strained and refrigerated the stocked and skimmed off the fat. I made this for dinner thursday night and it was delish! My fiancé was really skeptical when I told him the ingredients….but he loved it! He eats clean because I’m eating clean! LOL! I only used half the chili powder and it was plenty spicy for me….I cooled it off with some greek yogurt! This is going in my rotation to make again! thank you for this great recipe! This recipe is AMAZING! I fed it to my poor unsuspecting husband — he went back for seconds and thirds and all the while had no idea he was eating clean! I used chicken rather than turkey because that is what I had available, and I cooked it in my oven rather than crock pot because it was a cold rainy day. =) Oh my word, a repeat recipe for sure. THANKS so much and hope you keep them coming!!! P.S. You guys are inspirational! Lots of love! Making this tonight. Actually, made it 3 hours ago, but you get the point. Looking forward to it! Extremely simple to make. This has become a staple in our house!! Both my husband and I love this recipe!! I have tried many of your recipes! I love them all! Would love to see more crockpot recipes. Thank you so much for this blog!! I made this last night and didn’t have any roasted tomatoes so I used some roasted red peppers I had on hand and it turned out great! My boyfriend and I topped it with chopped raw onions and a dallop of light sour cream and we both loved it. Thanks so much for the recipe! Any other crockpot recipes that you may have I would LOVE to try them. We had this for dinner tonight. It’s the third time I’ve made it! It’s easy and soooooo yummy! Thanks for the recipe.